Esther Allen Howland (1801-1860) was born in Plymouth, MA to William and Betsey Barnes Allen and married Southworth Allen Howland (1800-1882) in 1823. They raised four children in their Worcester, MA home, including her namesake Esther Allen Howland (1828-1904) who graduated from Mount Holyoke Seminary, created a very profitable Valentine's Day card business and ironically, never married. The recipes were compiled during her first twenty-two years of marriage from "friends who have kindly furnished some of their choice and valuable receipts," from other works and original dishes. The first edition of 1844 sold 1500 copies in 15 weeks. Over 50 receipts were added and the Worcester publisher, S.A. Howland, her husband, noted in the 1845 edition: "twelfth thousand, improved and enlarged from the fortieth thousand." Every year for ten years he published and sold Esther's cookbook The New England Economical Housekeeper, and Family Receipt Book, and then from 1849 The American Economical Housekeeper, and Family Receipt Book at his large book and stationary store . Interestingly, that second year, 1845, three other publishers put out the book - they included the copyright info: "...in the year 1845, S.A. Howland, in...Massachusetts." 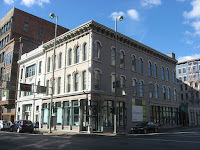 One lived in the same city of Worcester: William Allen, infact he lived in the Howland's home at 16 Summer St. Allen was either Esther's father or brother, and was a book-binder at 175 Main; while down the street at 135 Main was S. A. Howland's bookstore. 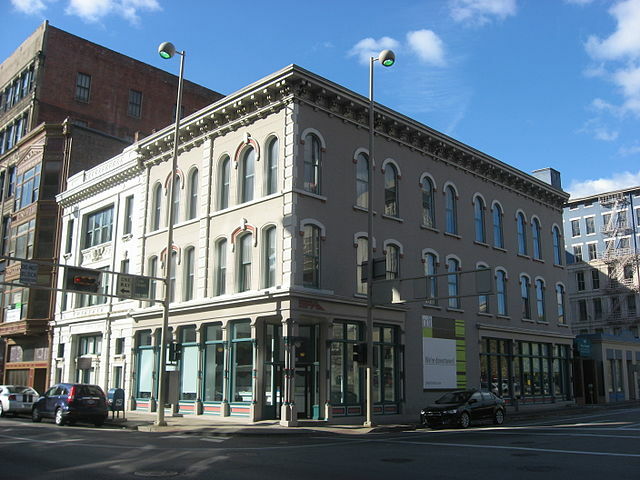 Another publisher in 1845 was a young Henry William Derby (1820-1892) recently arrived in Cincinnati from NY, who would become a prominent publisher and bookseller, his H.W. Derby store, on the corner, is pictured. The other publisher that year was Ezekiel Parker Walton (1789-1855) of E.P. Walton and Sons in Montpelier, VT whose son would be elected a US Congressman... Eliakim Persons Walton. E.A. Howland's work, under three titles, was reprinted by various publishers in Worcester MA, Cincinnati OH, Montpelier VT, Boston MA (several in Boston), New London CT, and Rochester NY, with the last printing in 1875. The third title under her name - The Practical Cook Book and Economical Housekeeper's Guide - copyrighted in 1864, (four years after she died) was a changed book and printed in 1865 and 1868 by two different publishers in Boston. The book printings are listed below. So what made her work so popular? Well, I bought my 1847 copy years ago just for the frontispiece. lovely. I still occasionally open the book to study the picture. The earlier editions had the intricate 'framing' topped with an American eagle (on a soup tureen?... I like to think so) around the busy kitchen scene. My yellowed copy is only 7" by 4 1/2" and 108 pages ...up from the 88 pages in the 1844 first edition. But the thousands of other purchasers wanted the book for its numerous recipes, cost cutting ideas and medical remedies. Some of the frugal recipes used the words cheap, economical, common and plain in their titles. One of her many economizing ideas was to save a dollar a week, and if started at 21, by age 61, the saver will have $6,150 ($192,000). There are about 20 pages with 62 numbered medical recipes or remedies ranging from hiccough (hiccups) and sea-sickness to some early CPR advice by the Surgeon-General of the American Shipwreck Society: "To bring the Drowned to Life" - press down on the chest repeatedly and then insert a bellows to force air in, and press down again to force the air out...repeat, for at least an hour. “The Medicinal Department [is]… not intended as a substitute for the family physician, still, there are times when his attendance or advice cannot be had at the moment when most needed. It is then that the receipts in this department will be found to be of some service." The many and varied recipes include New England standards - brown bread, salted cod, cranberry tarts, Johnny cakes and Election Cake. One page is devoted to a Thanksgiving Dinner menu (so similar to many of our traditional yearly dinners) of stuffed roast turkey, gravy sauce (first boiling neck, gizzard, liver and heart), Cranberry sauce, with mince, pumpkin and apple pies. The New England holiday tradition was promoted for years by cookbook author Sarah Josepha Buell Hale to be a national holiday and her descriptions of an 1827 Thanksgiving dinner in New England is HERE. "Cut some slices of pork very thin, and fry it out dry in the dinner-pot; then put in a layer of fish cut in slices, on the pork and fat, then a layer of onions, and then potatoes, all cut in thin slices; then fish, onions, and potatoes again, till your materials are all in, putting some salt and pepper on each layer of onions; split some crackers, and dip them in water, and put them around the sides and over the top; put in water enough to come up in sight; boil about half an hour, till the potatoes are done; add half a pint of milk, or a tea-cup of sweet cream, five minutes before you take it up." Salted beef that has begun to taint may be restored to its original sweetness by taking it out of the pickle and packing it over again in layers of charcoal; after which a new and sweet pickle, with a little saltpetre added, should be poured on it. The charcoal, it is said, will take out all taste of taint in a week. 86. Temperance Cake, No. 1. Three eggs, two cups of sugar, one cup of milk, one tea-spoonful of saleratus, nutmeg, flour enough to make it pour into the pan; bake it about twenty minutes. Allspice and raisins, instead of nutmeg, make a good plum cake. Attach a piece of flannel or sponge to a thread, made fast to the top of bedstead; wet the flannel or sponge with camphorated spirits, and the mosquitoes will leave the room. Feeding America. Biography and cookbook transcript of 1845 edition. Boston : J.S. Locke & Co date? The Practical Cook Book and Economical Housekeeper's Guide. Boston : B.B. Russell, 1868.